Happy Place, a pop-up exhibit where you can take Instagramable pictures, has arrived in Boston. If you're searching for your happy place... you might just find it in Boston at the namesake pop-up exhibit known for Instagramable pictures. Happy Place, an interactive space where you can pose alone or with your friends, opens Friday at 500 Boylston St. and runs through June 2. The 12 areas with larger than life backdrops include the world's largest indoor confetti dome, a giant rainbow with a pot of happiness in which to jump, an upside down room, and a cookie room complete with the aroma of fresh baked cookies. The idea for the traveling exhibit came from Los Angeles-based talent manager and producer Jared Paul. "These are the kinds of experiences I'm looking to do with my kids," said Paul, a father of three. "I just want to do something that's unique and fun. We've been going to a lot of museums in Los Angeles that are immersive and it's a trend we really enjoy." Paul said he wanted to come up with an idea that was not only fun but positive. "Happiness was just something I thought was a great direct theme that is bright and warm and I think we need a little bit more of right now," said Paul. Happy Place kicked off in Los Angeles in November 2017 before moving to Toronto and Chicago. Paul chose Boston as the next stop because he has a special connection, being the manager to the city's own New Kids on the Block. "They are a group of guys that are so proud of the city they are from and I feel like they carry that around the world with them and I've kind of gotten that inspiration from them and understanding of what Boston means to the people of this town — how proud people are being here and I just knew this was the city that would understand what Happy Place was and welcomes us with open arms," said Paul, who was also the driving force behind the Boston Strong benefit concert after the marathon bombings. At a special grand opening event Wednesday, social media influencers and people who just wanted to check out the exhibit were having a blast taking pictures for their Instagrams and other social media feeds. What is the Happy Place? It looks fantastic and fun, but what is Happy Place? Jared Paul, founder of the pop-up exhibit that has made its way to Boston, joins Sue. "What I liked about Happy Place is you can come here and take awesome pictures for your social media and just have a great time with friends and meet new people," said David D'Isola of Lynn. Carina Lopez of Jamaica Plain said she's like to return and bring her daughter next time. 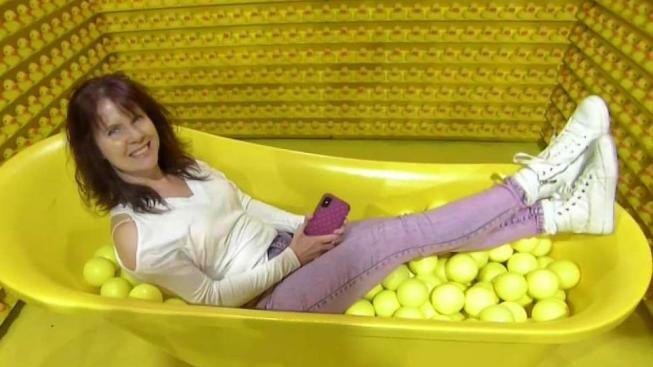 "What I liked the most is that there are a lot of interactive spaces — not just cute backdrops for pictures, but things like the ball pit that you can jump from," said Lopez. "This is very family friendly." A funny moment happened when a toddler went to get in the rubber ducky bathtub and thought he should undress first. His mother quickly stopped him, invoking laughter all around. In addition to the 12 areas, Happy Place also features a lemonade stand where net proceeds benefit the non-profits Action for Boston Community Development (ABCD) and Boston's anti-poverty agency. Happy Place is open Monday, Wednesday and Thursday 11 a.m.– 8 p.m.; Friday and Saturday 10 a.m.– 8 p.m.; and Sunday 10 a.m.– 7 p.m. General admission tickets cost $35 for adults and $25 for kids. Kids under three are free.